These tunes were recorded in a studio. 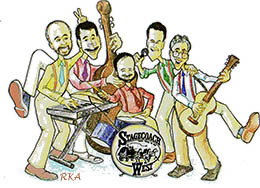 This is five-piece Stagecoach West. These particular samples are in MP3 format for faster Internet loading. However, they are still each about 1MB so please be patient loading them. Five Minute Sampler 30-second samples of 11 songs in one file. These particular samples are in WAV format and are rather large, about 9MB each. However, they should play on any computer system. These tunes were not recorded in a studio, but directly off the mixer at a live performance. They represent exactly what the audience hears at a live Serenade four-piece performance!